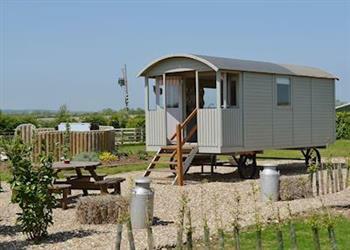 The Lincoln Longwool in Burton Fleming, near Filey sleeps 2 people. The Lincoln Longwool near Filey gives you the opportunity to wake up in the morning to an al-fresco style continental breakfast, surrounded by open pastureland. You can also opt for the full English breakfast (at an additional cost) with ’fresh on the day’ free-range eggs, courtesy of the owner’s own chickens. After breakfast, you can jump in the shower (complete with complimentary toiletries and robes) or better yet, jump in your own private hot tub. All this and more awaits you at Lincoln Longwool. 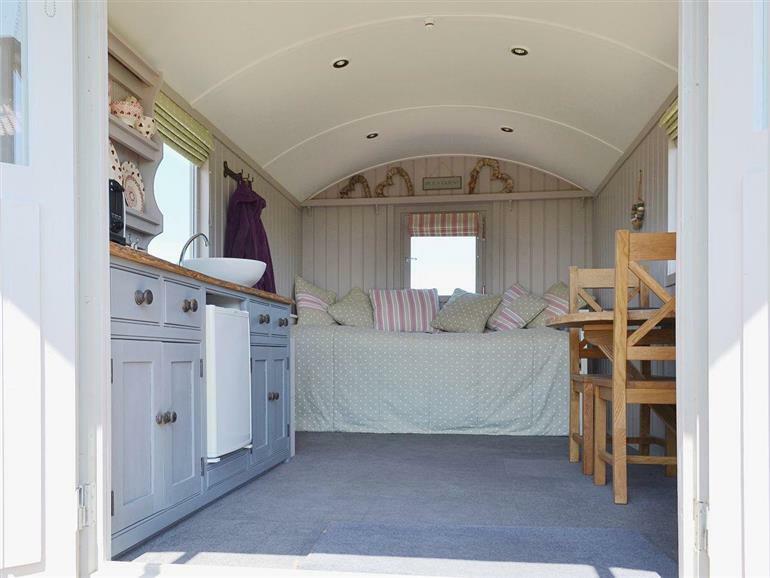 Set on a working farm, this fantastic shepherd’s hut provides excellent holiday accommodation that’s ideal for spending quality time with your other half in a secluded location. There’s a post office, pub and general store close by in the village of Burton Fleming and with the owners living adjacent, everything you need and more is at hand. Spend your mornings with your feet up and a good book in your hand, and after a day’s wandering the beautiful Yorkshire Wolds or the coast, you can open up a bottle of wine, light the fire pit and watch the stars come out. The beach is 5 miles. With the shop and pub ¼ mile, and the restaurant is 4 miles from The Lincoln Longwool near Filey. The Lincoln Longwool can be booked together with The Blue Texel (ref UK2066 [The Blue Texel]) and The Swaledale (ref UK2067 [The Swaledale]) to sleep 6 people. Bedroom area: With king-size sofa bed. Electric heater, gas, electricity, bed linen and towels included. Initial logs for fire pit included, thereafter £10 per box. Welcome pack. Shared external shower room with toilet. Continental breakfast free of charge and full English breakfast available . Barbeque food packs available for 2. Lawned garden with patio, garden furniture, gas Bar-be-que, fire pit and hot tub. Shared natural grounds with sitting-out area. Bike store. Private parking for 1 car. No smoking. Please note: No children/babes in arms. Holidays at The Lincoln Longwool run from Monday to Monday. For a better idea of where The Lincoln Longwool is, you can see The Lincoln Longwool on the map below. The Lincoln Longwool is in North Humberside; should you be on the lookout for a special offer, you can find all the special offers in North Humberside. It's always worth checking to see what is on offer at the moment. Do you want to holiday near The Lincoln Longwool (UK2065), you can see other cottages within 25 miles of The Lincoln Longwool; have a look to find your perfect holiday location.